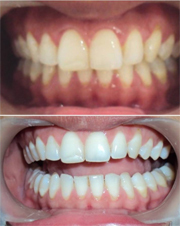 Cosmetic dentistry has improved drastically over the last few years and tooth whitening/bleaching forms an integral part of it.As a person ages, the adult teeth become darker due to changes in the mineral structure of the tooth as the outermost white layer/enamel becomes less porous. Teeth can also become stained by bacterial pigments, foodstuffs and tobacco. There are several methods to whiten teeth such as bleaching strips, at-home whiteners and in-office bleaching. Current tooth bleaching materials are based primarily on either hydrogen peroxide or carbamide peroxide. Both may change the inherent colour of teeth but have different considerations for safety and efficacy. »Bleaching is not recommended in children under the age of 18 years .This is because the pulp chamber or nerve of the tooth is enlarged until this age. Tooth whitening under this condition could irritate the pulp or cause it to become sensitive. »People who are sensitive/allergic to hydrogen peroxide should not try a tooth whitening system without consulting a dentist. »Tooth whitening is also not recommended for pregnant/lactating women. »Individuals with sensitive teeth and gums, receding gums and/or defective restorations should consult with their dentist prior to using a tooth whitening system.